We've got a bunch of exciting things happening in December here at Three Kings! We are participating in a charity art show to benefit Animal Haven Shelter presented by Biting Back NYC. From December 1st thru 3rd artwork will be available for purchase at A Bar ! Opening Night is Friday, December 1st from 7pm til 10pm at A Bar located at 597 Manhattan Ave. in Greenpoint, Brooklyn! 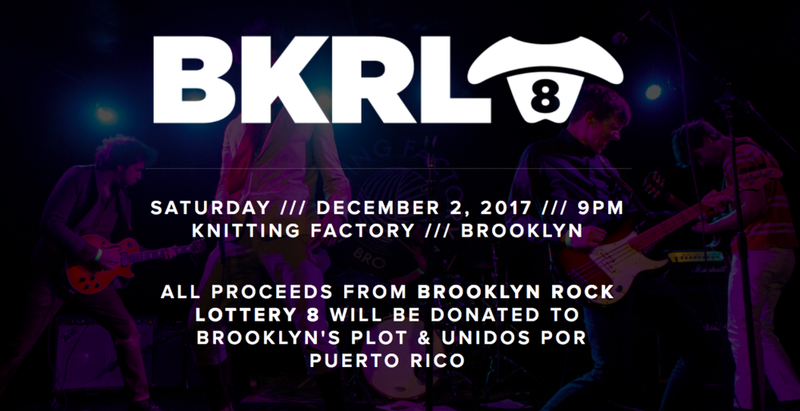 We're one of the proud participants in the eighth annual Brooklyn Rock Lottery happening Saturday, December 2nd at The Knitting Factory ! All money raised will be donated to Brooklyn's Plot and Unidos Por Puerto Rico . One of our favorite neighborhood schools; PS34 is holding their annual Fall Auction! You can bid on local artist's wares, gift packages from local businesses, tickets to awesome area concerts AND MORE! To check out all the amazing things available to bid on, click here ! We've got our annual $1,000 Gift Certificate Giveaway happening now until December 31st! To be entered to win, you must book an appointment for a new tattoo with one of our resident artists between December 1st and 31st! Your appointment date can take place after the New Year, you just have to be sure to book before the 31st. The Gift Certificate is good for either our Brooklyn or East Village location with any of our talented resident artists! One lucky winner will be selected at midnight on December 31st. Good Luck to all who enter!! FREE THREE KINGS TEE WITH ANY GIFT CERTIFICATE PURCHASE! Any gift certificate purchased in store or online during the month of December will receive a FREE Three Kings T-Shirt! We're keeping it a surprise as to which one you'll be sent, just be sure to note your shirt size in your order! The Three Kings Holiday Party will be happening on Monday, December 18th and both our shops will be closed. You're invited to join us after 10pm at Montana's Trail House! Monday, January 1st - CLOSED, HAPPY NEW YEAR!!! !